ATV Tires | UTV Tires | Free Shipping at All Terrain Online! ATV Tires | UTV Tires | Free Shipping at All Terrain Online! 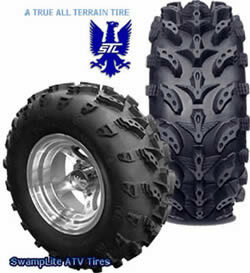 All Terrain Online carries over two dozen styles of ATV tires in stock. Choose from Carlisle, ITP, Maxxis, Gator, Gorilla, and other brand name tires. Check out our All Terrain mud tires, turf tires, and radials. Look to All Terrain Online for tires to fit any ATV or UTV including Yamaha Rhino, Kubota RTV, John Deere Gator, Kawasaki, Polaris Ranger and other ATV brands.